The invention of the steam pump transformed Britain's small 18th-century coal mining trade into a colossal industry, which employed hundreds of people to produce hundreds of thousands of tons of coal. 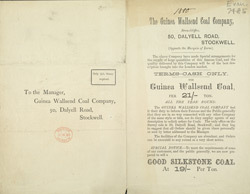 A small number of companies owned the coal fields of northern England. Shareholders made enormous profits from the long hours worked by the miners in dangerous, unhealthy conditions.